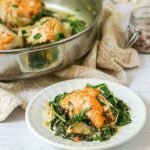 This tapenade stuffed chicken with creamy spinach & artichokes dish is a deliciously low carb dinner you make in one pan. The creamy spinach and artichokes go perfectly with the tasty tapenade that the chicken is stuffed with and each serving is just 4.7g net carbs. Take your chicken pieces and one by one, place in a baggie and pound thin with a meat mallet. In a food processor add the olives, garlic, sun dried tomatoes and basil. Pulse until the tapenade is formed. Or you can chop by hand. Take each piece of chicken and add a spoonful of the tapenade and then roll each one up. Add a toothpick to keep in place. Add oil to a large skillet and heat to medium high. Place the chicken and then turn the heat to medium. Once the chicken is browned on one side, scoop up with a spatula and carefully take out the toothpick, flip over and replace the tooth pick. Do this to each one to brown the other side. When browned on both sides, take out and set aside. Add the chicken broth to deglaze the pan. Add in the cream and Parmesan cheese. Whisk to combine and then add in half of the spinach and the drained artichokes. Nestle the chicken rolls back into the spinach, cover and simmer for about 10 minutes. When the chicken is cooked through, add in the second half of the spinach. Mix around and it will wilt immediately. Take off of the stove and serve. *Note: Though the thin sliced chicken breast are pretty thin, I like to pound them thinner because it makes them, easier to roll, more tender and they cook faster.